The Gorbeau House is a run down looking place that appears smaller on the outside than it actually is. It’s a TARDIS! There used to be two guys that lived there. 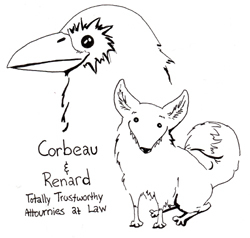 They were lawyers and their lawyer bros made fun of them by creating cute poems in reference to their names: Corbeau (Raven) and Renard (Fox). Eventually they got fed up with this little rhyme dedicated to them and applied for a name change. Probably not a bad idea. I don’t know that I’d want to employ the Raven and Fox law firm. That sounds a little TOO crafty. So, they went before the King. And the King decided that Corbeau would get a fancy flourish added to his name to make it Gorbeau. As for Renard he got to add a P, making his name Prenard, which this text is telling me means “grasping fellow”. It’s not much of an improvement. Wait, so what I’m getting here is that in order for your name to be changed, you have to petition for an audience with the King, and the King just gets to name you whatever the hell he wants? I don’t know that I’d want to roll that dice! Anyway, that’s why the Gorbeau house is called what it is called, and there are spiders there. Gigantic spiders. This quiet creepy corner of the city is where Jean Valjean has made his home. Before we go any further, let me issue a correction: Jean Valjean is fifty five according to this chapter, because it’s right there in black and white. He just looked like he was in his sixties before I guess. This is what I get for letting things marinate in my brain for too long. I forget. That’s why I’m writing this in the first place! Well, the only things Valjean has in his living space are a mattress on the floor and a cot. He places Cosette on the cot and the next morning watches her until she wakes up. She’s really disoriented at first and still thinks she’s at the Thénardier’s, but she’s safe for now. Catherine is there, and her buddy Valjean is there and there are no more floors to be swept. While he’s watching her, Valjean has this strange feeling come over him. It’s nothing he’s never felt before. Could it be… love? But wait! You might be saying. What about Valjean’s family? We learned about them. He clearly loved them because he took care of them and stole bread for them. That’s what got him here in the first place. Had things turned out differently would he still be pruning hedges? Well, all of that was before prison messed him up and hardened his heart. It’s been so long that he doesn’t really remember them. Though he has tried to search for them and hasn’t turned up neither hide nor hair. We didn’t get to hear about any of that though, because we were off learning about history, and vulture eyes, and giant Gorbeauian spiders. Cosette is here now, and she is successfully melting Valjean’s heart, and he’s feeling real love for another person for the first time twenty five years. They spend their days in each other’s company, only going out at night. Valjean’s trying really hard to stay under the radar now. No more being on the lam while simultaneously rebuilding an entire industry and rising to a prominent position in a political office. Nope. He’s going to find the darkest corner in the biggest city and hide this time. We get to learn that Valjean has been teetering on the edge for a while now, and Cosette bringing love back into his life has pulled him back over to the side of virtue again. See, in all this time, even the bishop’s influence has been waning on and off. It’s been a while since his kindness had touched Valjean’s heart, and he was starting to get disillusioned once again. What with Fantine’s sad story, and him being imprisoned again despite everything good he’d done and despite doing the right thing by turning himself in so Champmathieu didn’t have to go to jail who can blame him?. Yeah, so Valjean was close to falling off the wagon after all apparently. As for Cosette, for the first time she has someone that cares about and someone to call father. He tells her all about her mother, and teaches her to read…something he learned in prison for the express purpose of doing bad things. He feels happy about using his powers of literacy for good. They go on walks together, but sometimes Cosette stays behind with the nosy landlady to watch. This woman is the only other person to live in the house and functions as a sort of concierge. It turns out that, though she still has her quiet moments, Cosette loves to play. She’s an actual kid underneath all that sadness. Wouldn’t you know it? Of course the nosy landlady has speculation about Valjean, and she snoops around, one day following him to a deserted room in the house where she spies him removing a thousand Franc note from the lining of his old yellow jacket. He still dresses as a poor man despite all his money, so much so that people mistake him for a beggar as he’s walking in the street and they give him money. He in turn discreetly gives even more money to the actual beggars. They call him the beggar that gives alms. Anyway, later on the lady snoops some more and feels around in his jacket while he is otherwise occupied. It has everything in there: Needles, thread, wigs. Wigs? I know, I know, they’re probably in there for clever disguising should he need it, but how big is this coat? How many pockets does it have? Is it some kind of bag of holding? In the lining she thinks she can feel other paper notes hiding. There is a certain beggar that Valjean always gives money to, and one night as he hands over the cash, he looks down and thinks that instead of the usual guy, it’s Javert! That can’t be, but he doesn’t ask. He just goes on about his biz and frets over it until the next time. When he looks the man in the eye it actually is the beggar he remembers. Valjean convinces himself that he was just imagining things. He wonders why he would be imagining Javert after all this time. Maybe it’s some kind of post traumatic flashback? He becomes even more worried when he hears someone come into the house one night and he knows it isn’t the landlady, because she’s usually in bed by that time. He rationalizes that maybe she’s ill and had gone out for some medicine. He blows out the candles, and tells Cosette to go to bed quietly anyway. He sits there nervously in the dark listening to the unknown footsteps in the hallway. He can see a light through the keyhole as if this stranger is just standing there in front of his door with a candle. Eventually the stranger moves on since there isn’t a peep coming out of Valjean’s room. The next time Valjean hears the man go by he peeps through his extra large keyhole to see what he can see. What does he see? What is happening? I don’t know, but this simply cannot be coincidence. Valjean questions the landlady the next day, and she informs him that Javert is the new tenant. She thinks his name is Dumont, and he is just a guy living on his income just like Valjean is. She could have meant nothing by that, but Valjean has in his brain that there’s something behind those words. He packs up some money, and gets Cosette and they head off down a seemingly deserted street.